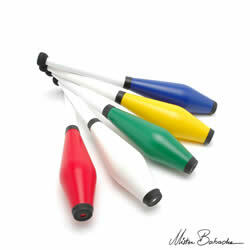 To learn to Juggle 5 clubs, it is expected that you can already juggle a very good 3 Club Cascade. It is not essential that you have learned 4 Club juggling as odd numbers of balls are juggled differently than even numbers, but there are several 3 & 4 Club tricks that will help you learn. The 5 Club Cascade is the exact same pattern (infinity sign also known as a side on figure of eight) as the 3 Club Cascade, only it now has to be approximately twice as quick and twice the height. As each and every club has to pass through the same centre point directly in front of your body, there is potential for plenty of collisions unless you can work out your timings and improve on your accuracy! For this reason, it might be worthwhile learning the 5 ball cascade before moving on to the Club version of the trick. Be prepared for this skill to take months (or even decades) to learn. If you aren’t prepared to put in a decent amount of time, then feel free to stick with learning lots of cool 3 and 4 club tricks. Numbers juggling isn’t for everyone, and people can be very impressed with lots of tricks using fewer objects! How to hold 3 Clubs in One Hand. The “Circus Grip” is where you hold one club’s handle against the fleshy part between your thumb and forefinger. The next club is placed beside it, but with the handle tucked underneath, and the third club is placed beside the second with it’s handle tucked underneath. There are other methods you can try (a YouTube search will uncover lots of tutorials, so you can decide which grip is the best for you). TOP TIP: The first throw may be a lot more difficult than the other throws (because you don’t have as good a grip on the first Club especially compared to all the others), so it may be worthwhile practicing holding all 5 Clubs, and just throwing the first Club from each hand smoothly for a while. Double Spins: Throw the club twice as high so that it spins at the same speed as with the single throw, rather than try to keep the same single club height and throw it twice as fast. You may find it easier to start with a normal 3 Club Cascade pattern then introduce one double spin, and build your way up from this, or just try making every throw a double straight from a 3 club start – the choice is yours, but it needs practiced loads. High 3 Club Cascade Practice throwing every Club to a 5 Club height and get the height consistent with every throw. 3 Club Flash From a start or while doing a regular cascade, throw all 3 Clubs high (so that for a brief moment both hands are empty), and then continue. Flash With Handclaps Perform the 3 Club flash (see above), and as soon as you have released the third Club, clap your hand once. Now try again but this time clap your hands twice before continuing the cascade. These 2 claps would represent the 4th and 5th Clubs being thrown in a cascade pattern, so it is a very useful trick if you can get into the rhythm of doing this trick continuously. Hands Down to Knees Juggle a 3 Club cascade but bring your hand down to below your knees before throwing the Club high. 4 Club Tricks (to help you learn 5 Club Cascade)! 4 Club Half Shower Start with 2 clubs in each hand. Now throw one high from one hand and one a bit lower with the other hand (so that they don’t collide). When both clubs peak, throw the next club in each hand (same hand low, same hand high) and keep going (remember to practice the trick in both directions and see if you can manage to change direction during the trick! 4 Club High Throws Try throwing the clubs even higher (but still just a double spin). The aim is to get a regular tempo going and to make sure that the clubs aren’t wobbling too much (if it does wobble, it takes up more space and therefore more likely to collide! 5 Club Flash 5 throws followed by 5 catches. The 3 Clubs from your favoured hand should end up in your weaker hand, and the 2 Clubs from your weaker hand should end up in your favoured hand. You may find that it is your second or fourth throw that is consistently off in the same manner each time and this trick gives you the chance to concentrate on improving that particular throw. Improve your Accuracy & Timing Throw the 5 clubs and let them drop on the floor. Look at where they have initially landed (before they begin to roll away)! They should have landed roughly in a clump of 2 near each other and 3 near each other. Try this several times and listen to the noise as each club hits the ground. It should be an even tempo of drops. If clubs are hitting the ground at the same time or immediately after another, then you need to improve your timing and try again! A Different Coloured Club Try using 4 Clubs of the same colour and one Club of a different colour. This will help you to keep count of your cascade pattern if you start by throwing the different coloured ball, then you know every time it is caught in a Cascade pattern, you have made another 5 catches! If the pattern gets too wide This happens when you don’t have enough time to bring the hands back towards the centre of the body to make your next throw. Try throwing a little higher to give yourself some extra time to return your hand to its proper throwing position. I can manage “10+” throws and then can’t get any further! Try a few 5 club flashes (5 throws and 5 catches). Aim for accuracy, and get your timing improved. Now try to achieve 10 clean throws and catches and stop. If you can keep the first 10 throws and catches clean, then you should be able to keep going with a bit of practice! It may be helpful to stop trying to count the clubs as this may be taking up too much of your concentration! You only need 3 repetitions of 5 clubs to be classified as a 5 club juggler (15 catches), so keep practicing! 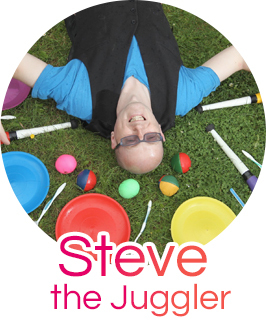 When you are ready for learning some 5 Club Tricks, just work your way back through the tricks on my 3 Club Juggling Tricks page. You could also learn all of the 3 club tricks using double spins instead of single!